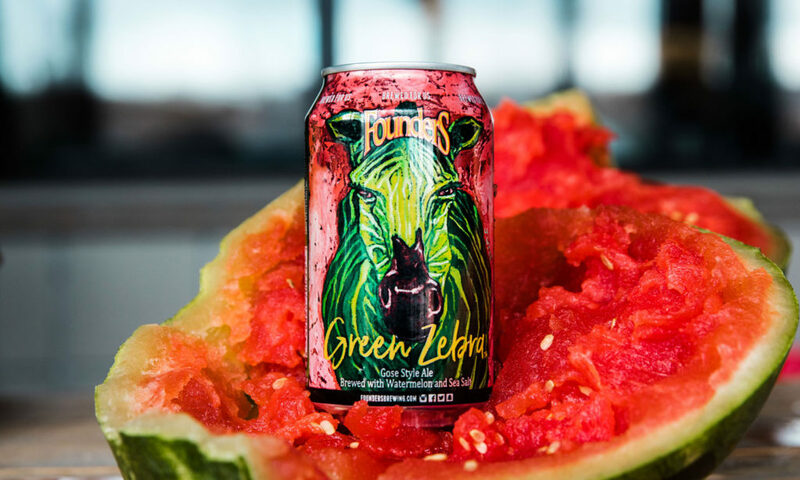 New Summer Seasonal: Green Zebra - Founders Brewing Co.
Posted on March 18, 2019 by Founders Brewing Co.
No, we didn’t just blow up a watermelon via rubber bands for no reason: we’re happy to share our newest member of the seasonal lineup (although not an unfamiliar face), Green Zebra! While Green Zebra was originally slotted to return as a Limited Series release, its success coupled with the immense popularity of the gose/sour/wild ale styles justified it having greater availability. The most exciting part? It’ll be available in 15-pack cans in addition to draft and 6-pack cans. Yes, 15-pack cans! Green Zebra will be available in the taprooms beginning on April 5 and will ship everywhere else the following week. It will be available through July. You can find it near you by using our beer finder. Green Zebra follows Azacca IPA in the seasonal lineup and precedes Mosaic Promise.